Unable to render webpages in Outlook after updating Outlook Security? If you have recently installed the October 2017 Outlook security update, you will notice that webpages are unable to render through the Outlook folder pane using Dynamics 365 for Microsoft Outlook add-in (Outlook client). In this case, the update has to remain installed due to the fact that it resolves numerous significant vulnerabilities. Microsoft are working on fixing the problem, however, in the meantime, a registry key must be added to the local client machines (running Microsoft Dynamics 365 for Outlook) through direct registry edit or via Group Policy in your organisation. Devices with no compliance policy, in Intune, were previously considered as compliant, however from November onward, this will no longer be the case. If you use compliance policies with Conditional Access, devices that have no compliance policy assigned to them will be deemed as ‘non-compliant’ and will consequently be blocked. What this means for end users that were connected to these devices and allowed access to emails, is that they will lose access unless something is done about it. To stop this becoming an issue, please ensure that ALL devices have at least one compliance policy assigned to them by mid-November. 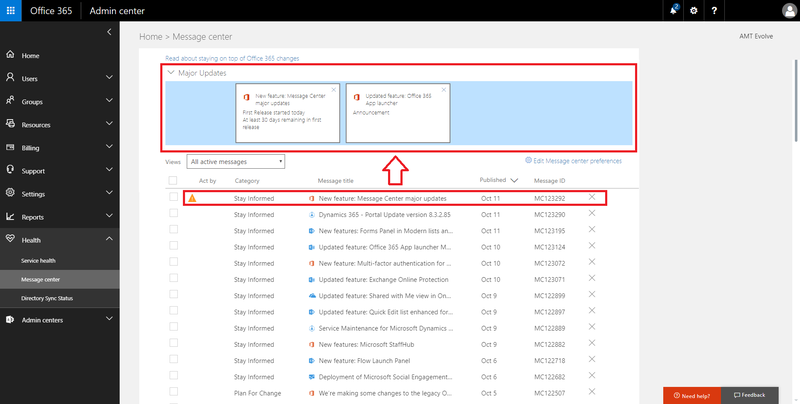 Message Centre in Office 365Microsoft has started to roll out a new update, completing in November, for the Message Centre. Emails regarding web UI, weekly digest and new emails will be flagged as ‘major updates’. This means that administrators and IT managers will be aware of release dates for new updates and any other information that goes along with that. Manage Data Governance in Office 365A new feature which is currently in preview, is the events based retention process. Essentially, this is all about keeping the data you need and getting rid of it when you need to. This manages the content life cycle of importing and storing data, and creating policies that retain and permanently delete. There are 5 steps to this cycle. Multi-factor authentication for Office 365 Security and Compliance CentreIf you use PowerShell to connect to Office 365 security and compliance centre, there will now be a multi-factor authentication put in place to add in another layer of security. If your company has an on-premise directory, you can now use federated authentication. General Availability of Customer Key in Office 365Customer Key allows customers to provide and control their own encryption keys that encrypt the data in Office 365. In order to assist companies, the control customers have allows them to revoke keys in order to make data unreadable and to initiate the data deletion process. Services like Exchange online can have up to 50 data encryption policies in different mailbox groups, whereas SharePoint and OneDrive for Business allow encryption policies per tenant.Having control over encryption keys can mean there is a higher risk of data destruction. In order to address this potential risk and improve data integrity and availability, there is a strong key escrow model – recovery key – in case keys are lost or stolen. If keys are revoked, the recovery key will be destroyed, along with the customer’s data as part of the data deletion process.In terms of audit and assurance, with the help of PowerShell, customers will be able to verify customer key activity and validate customer key controls with upcoming independent third party SOC audits.Customer keys is built on top of service encryption which is an added layer of security and protection on BitLocker. previous post: 60 Second Briefing: What is Microsoft Teams? next post: 60 Second Briefing: What is PowerBI?